Although a wholesome meal is often deemed as the best, it is at times easy to go for a quick-fix meal especially when we need to save time. It is essential to keep in mind that not all frozen food products are bad. Some frozen foods are in fact picked and packed when their ripeness and nutritional value is at the peak. Here are some tips on choosing the best and healthy frozen food products. The first step is to inspect the frozen food packaging. In this case, one should check whether there are ice crystals. The presence of ice crystals is an indication that the contents inside the packaging were thawed and then refrozen. Large crystals may lead to rupturing of food cells thereby creating mushy texture when consumed. It is also essential to read the labels when purchasing frozen food products. Among the key essential things to look for is the content of fat in the foods. Consumers should choose meals with at most 10-15 grams of fat in a serving. Otherwise, the fat content should be maintained at 35 or less percentage of calories originating from fat. The sodium content per serving should also be checked when reading the labels. Steaming some frozen foods help to retain many of the natural nutrients and texture. Many brands come prepackaged in bags that can go directly into the microwave and the food steams right inside the bag. 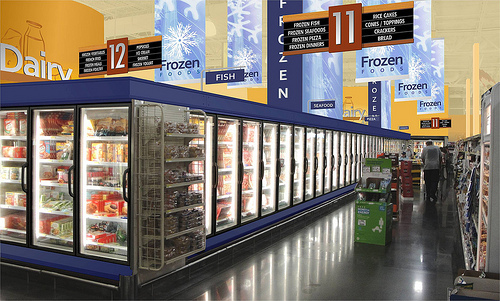 Shopping for frozen food products should come last when checking through the list of grocery items. Therefore, consumers should learn to pick frozen food last before leaving the grocery store. They should also not be left in a hot car to avoid defrosting them.